CA Inc. CEO John Swainson (pictured) is evangelizing opportunities in software as a service (SaaS) and managed services. During the company's CAWorld conference in Las Vegas, CA unveiled three SaaS offerings. Here's the scoop, and the implications for managed service providers. 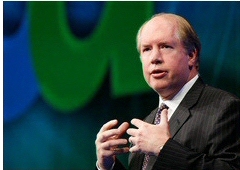 CA Inc. CEO John Swainson (pictured) is evangelizing opportunities in software as a service (SaaS) and managed services. During the company’s CAWorld conference in Las Vegas, CA unveiled three SaaS offerings. Here’s the scoop, and the implications for managed service providers. Of the three, Instant Recovery On Demand seems most clearly positioned for VARs and MSPs. Among those evangelizing the instant recovery service: masterIT, a managed service provider ranked No. 6 on last year’s MSPmentor 100 list. Remember, this is not the CA you grew up with. A few years ago, Fortune Magazine called Computer Associates The Most Dysfunctional Company in America. An accounting scandal ultimately landed former CA CEO Sanjay Kumar in prison. But under the more recent leadership of IBM veteran Swainson, CA has gradually regained the trust of customers and Wall Street. Things aren’t perfect at CA. But from what I’ve seen, CEO Swainson has changed major portions of CA’s DNA for the better. And Wall Street was upbeat after CA’s earnings results in October. Now for the problem: CA is a bit late to the managed services and SaaS markets. Although SaaS stocks are down 50 percent from January to Nov. 14 2008, I remain convinced that more and more of the IT channel will shift to SaaS solutions. Starting today, CA is getting into the SaaS game a bit more aggressively. The effort starts with the CA Instant Recovery On Demand service. The system is based on CA’s XOsoft High Availability technology and a hosted cloud service. The system has application-aware replication and automatic failover for Microsoft Exchange, SQL, IIS, SharePoint, Oracle, Blackberry Enterprise Server and File Servers. Partners can find more information at www.ca.com/instantrecovery. The instant recovery service is slated to launch early next year. CA also evangelized On Demand versions of CA Clarity PPM (Project & Portfolio Manager) and CA GRC Manager. Clarity PPM On Demand assists with IT portfolio planning, demand management, project management, resource planning and time, cost and earned value management. By contrast, GRC Manager On Demand helps organizations to automate risk and compliance processes. It’s still early in CA’s SaaS game. But I’m eager to see if/when CA launches an on-demand version of ARCserve, the company’s on-premise backup and restore program. Rival Symantec has already launched the Symantec Protection Network — an online storage service that also integrates with Backup Exec, Symantec’s on-premise storage management software. Given their strong positions in both storage and security management, I expect to see CA and Symantec competing quite fiercely in the SaaS market. Computer Associates fell off my radar during the accounting scandal. I didn’t want to be associated with them but the current CEO seems to have things going in the right direction. We’re giving service desk stuff a look. My customers aren’t really ready for SAAS yet though. SAAS seems like mostly hype.